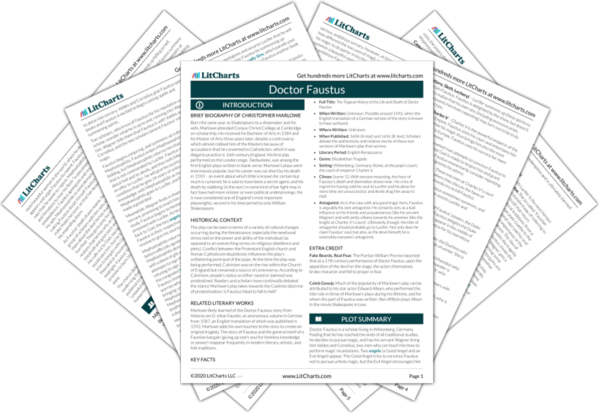 Instant downloads of all 945 LitChart PDFs (including Doctor Faustus). The timeline below shows where the character A Knight at Charles' Court appears in Doctor Faustus. The colored dots and icons indicate which themes are associated with that appearance. Fredericksen, Erik. "Doctor Faustus Characters: A Knight at Charles' Court." LitCharts. LitCharts LLC, 3 Nov 2013. Web. 23 Apr 2019. Fredericksen, Erik. "Doctor Faustus Characters: A Knight at Charles' Court." LitCharts LLC, November 3, 2013. Retrieved April 23, 2019. https://www.litcharts.com/lit/doctor-faustus/characters/a-knight-at-charles-court.